I’m all about the hearts this Valentine’s day! 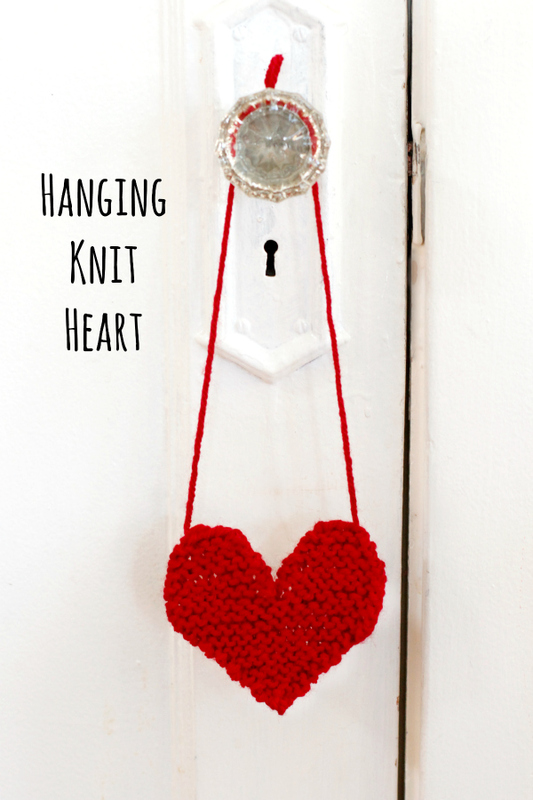 So of course I’m making a hanging knit heart to hang on my front door, letting my sweet family know they are loved! As I’m starting to get the hang of knitting, I’m becoming more and more in love and looking for all sorts of simple patterns I can knit in a day! I found this pattern for a knit heart and it’s a perfect project. 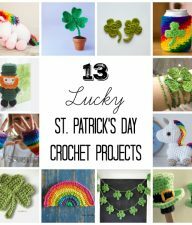 It’s super quick, you’ll be knitting these to display all of the house. 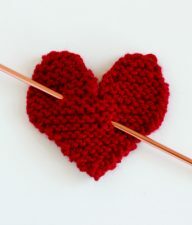 Yes, your heart might have a few holes on your first go of this pattern, (mine certainly does), but have fun knitting! 1. 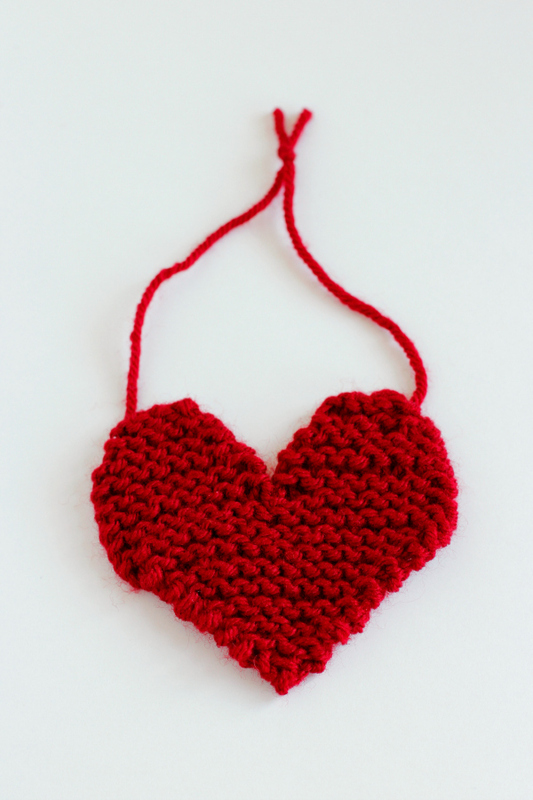 First make your heart from this pattern – Knit Heart Pattern via Julie & the Knits. 2. 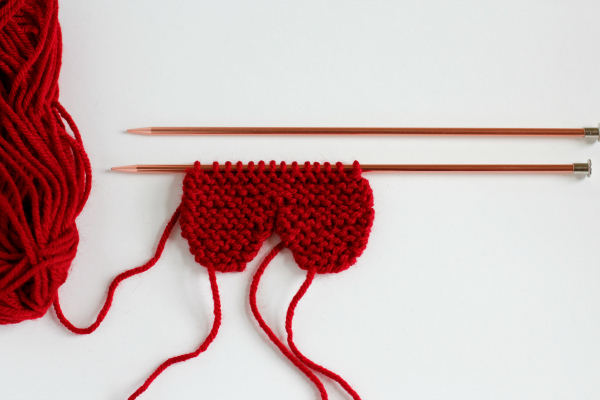 You’ll have 4 tails at the end of this project, so hide the pointed tip tail and the center tail, leaving your 2 tails over the heart bumps long. 3. Thread one of the tails to the outer edge of your hump to even them both out for hanging. 4. Tie them together at the top and now it’s ready to hang. You can also thread the tails back through the heart piece and it makes for a fun flat heart. Maybe a sweetheart coaster? Or stitch a pin to the back for a fun heart-shaped pin lapel. Or simply stick your knitting needles right through the heart for Cupid’s arrow! Either way you display your heart, it’s a lot of fun to make! Find the knit heart tutorial at Julie and the Knits. 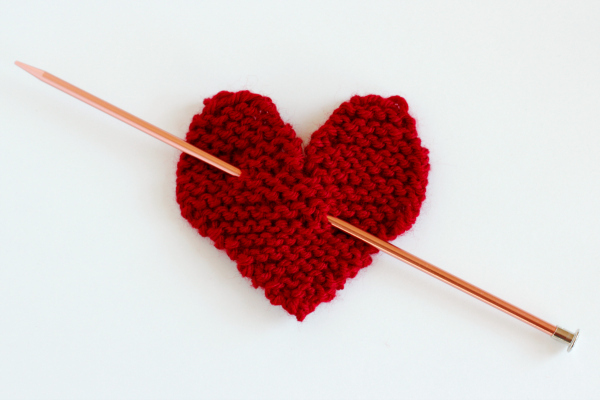 Crochet Heart Pencil Toppers – Add a pencil to them and they are even more heart-tastic! These crochet heart pencil toppers make great gifts to give on Valentine’s day. Chain Stitch Hearts – Make a few of these crochet heart chain stitch ribbons to wrap up your treats to loved ones on Valentine’s day! 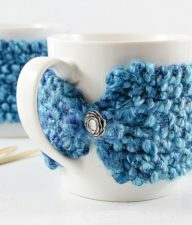 They’ll love the added touch to their gift, plus they can reuse the heart yarn ribbon for more gifting! 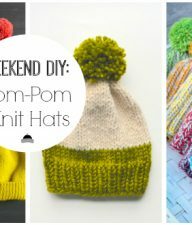 Stitching Hearts on Snow Hats – These fun little hats are super easy to embellish. With just a little yarn, they’re perfect for wearing on Valentines day or out in the snow.